All too often these days, we read about another life lost to food allergies – generally in our younger community. Personally, I can’t imagine how I would react if it were my child. Would I struggle to live normally during a lifelong grieving process? Would I avoid talking about what happened to my child and food allergies in general? Or would I have the courage, strength, and drive to dive deeper into the food allergy world in an effort to save others from facing similar devastation? The past few years have seen greatness arise from such tragedies. Consider Red Sneakers for Oakley or Project Abbie. Years prior, however, the food allergy world gained a new superhero, driven to his mission by his son’s early passing from a peanut. He has shared his story many times over the past decade, raised hundreds of thousands of dollars for food allergy research, and is still motivated to do more. His name is Brian Hom and you need to read his story. There are some very important lessons that should cause some of us to take pause and reconsider how we protect ourselves or those we love. I am so grateful for Brian’s willingness to share his story with me for the benefit of all of us. I can’t imagine it’s ever easy. Paul Antico: Brian, thank you for taking the time to speak with me today. A significant part of your life over the past decade has been impacted by food allergies and food allergy advocacy. Would you mind sharing the details of your story? Brian Hom: This all began on July 1, 2008 when my family planned a special vacation to Cabo San Lucas, Mexico for my son who had just graduated from high school and celebrated his 18th birthday on June 25. Early that morning, my wife, my three sons, and I left our home to fly down to Cabo. We arrived in Cabo around 6:00 or 7:00 at night and got to the resort around 8:00 pm. The restaurants were about to close so we just threw our suitcases in the room and went to eat at one of the restaurants in the resort. Everything seemed fine; it was a nice dinner. Later, we strolled along the beach to take a look at the facilities. When I got to him in the lobby, his lips were blue, his face was pale, and I thought he was choking on the cough drops. He couldn’t talk; he was gasping for air. My first thought was, “Where’s the doctor?” They were supposed to have a doctor at the facility and there was no doctor. They said he had left at 5:00 and I asked, “Is there an ambulance available?” They said they were calling one. The staff at the resort started to do CPR on my son because he had basically gone unconscious. It seemed like forever for the ambulance to get there, but it finally arrived and the paramedics tried CPR. My son was just getting colder and colder – his body was getting colder and my wife was holding him. The doctor finally got there and he took a pulse on his neck, put his head up to my son’s lips and just turned to me and said, “Sorry,” and covered him up with a sheet. He had passed away. We found out that there were traces of peanuts in the chocolate mousse that triggered the anaphylaxis in my son B.J. who had never suffered anaphylactic shock in his 18 years. He had his first incident, a peanut allergy reaction, when he was two years old and the doctors prescribed him an EpiPen at that time. But the next year it expired, and we’d go for annual checkups with the doctors, who never really focused on his food allergy. He was born in 1990 and, back then, food allergies weren’t very prevalent. Paul Antico: I’m so saddened to hear this story and so sorry about the loss of your son. In the 18 years he had a peanut allergy, did he ever have other reactions? Brian Hom: Yes, he would a get rash, itchy throat, maybe a runny nose. His eyes would get kind of red, but never did it cause him a problem breathing or closing of the throat. In Mexico, when he had that anaphylactic reaction, there was no rash, there was no itchy throat, nothing other than that his throat was closing on him. There were no signs of his normal symptoms when he eats something that he was allergic to, like the peanut, where he would basically start getting itchy—he would start scratching, he would get hives. But none of those symptoms came along. Paul Antico: Roughly how many times had B.J. had peanut exposures and these lesser reactions, prior to this anaphylactic event? Brian Hom: I’d say around 10, maybe. Paul Antico: Okay, because I see two incredibly important takeaways that I’d love to just get your comments on. One is that the medical community always tells us—and again, it’s very different now than it was in 2008, for sure—to understand that the severity of one reaction doesn’t imply the severity of future reactions. Frankly, even I’ve had a hard time grasping that with two of my kids’ allergies, where the reactions have always been modest. Though your story is a huge wake-up call for me and, I’m sure, many others. The second takeaway is obviously that we should always carry epinephrine, even if prior reactions have been mild. I assume you agree with these, but I’m wondering if you had any other thoughts on them. Brian Hom: Oh, definitely, I agree. Yes, at my restaurant [which we discuss a little further down], I talk to hundreds, if not thousands, of people that say, “I only get mild reactions. I know, my tests show that I should have severe reactions but I don’t, and so I don’t carry an EpiPen.” My warning to them is, all it takes is one bad reaction, and if you can’t get to the emergency room quickly, it could be fatal. My third son, who has a peanut allergy as severe as my son B.J., who passed away, had his first anaphylactic reaction at 17 and he had never had anaphylaxis his whole life either. His name is Steven and he’s 23 now. We went to a Vietnamese pho restaurant—we’d been eating there for three years or so and my son had always ordered the same dish, but they happened to change the recipe without putting any warning of the change in ingredients. He had a full anaphylactic shock. But we were able to save his life because he had an EpiPen and we were able to get him to the emergency room and get him on IV and get him on a breathing machine. The other thing is B.J. died at 18; Steven had his first anaphylactic reaction at 17. I tell other people that you might have mild reactions now, but your body changes in time, and once it starts recognizing the allergens quicker, the shutdown of your body can be quicker. Paul Antico: Can you tell me roughly how many reactions Steven had prior to this anaphylactic reaction, and what his typical symptoms had been? Brian Hom: Yes. He’s had probably less than 10—because he’s very good at avoiding peanuts. He reads the labels, he will not take a risk, he watches where we eat. He’ll avoid trying anything that’s not labeled or doesn’t know what kind of ingredients are in it. Paul Antico: Okay, and his reactions in the past, like B.J.’s, had also been relatively mild until this incident? You said something else when you were talking about the individuals that come into your restaurant and say, “Well, I’ve only had mild reactions.” While we’ll talk about your advocacy in a moment, I’m sure you share some of what you learned with these patrons. How do people react? Do you feel like they believe you more? Are they shocked that this can happen? Or do people usually know but say, “Well, yes, I’ve been told that, but—you know”? Paul Antico: Right, that is really important, because there are many adults with food allergies who take them for granted—and especially now, as the first big wave of food allergy kids, as I call them, are in college or coming out of college, and they’re going to be starting families of their own. That’s a great message to give them. You said you have three boys. What is your other son’s name and does he have food allergies? Brian Hom: His name is Brandon. What’s interesting about Brandon is, after B.J. had passed, we had him tested. The normal blood test showed that he had a high IgE in his blood [to peanuts], but he’d been eating peanuts all his life. He was 15 when B.J. passed away so we had him carry an EpiPen for a year until he was 16 or almost 17. Eventually, it was determined that that it was safe for Brandon to continue eating peanuts, despite high IgE numbers, so he no longer carries an EpiPen. Paul Antico: Brian, do you and your wife have allergies? 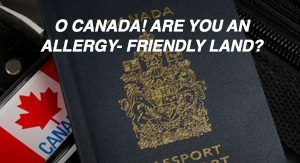 Brian Hom: Neither my wife, Kathy, or I have food allergies. We do have seasonal allergies, like dust and pollen. 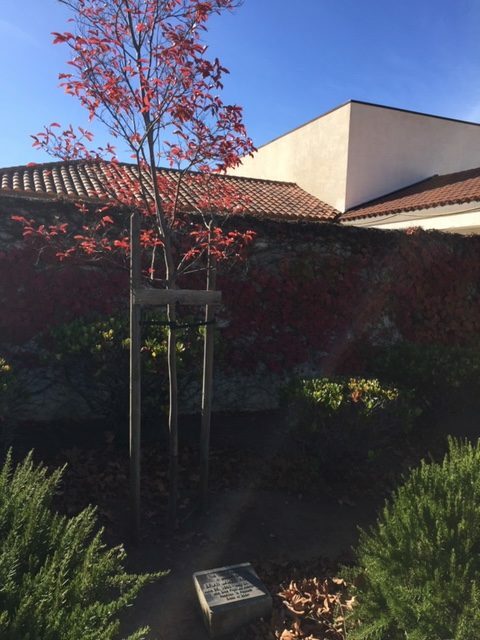 A tree established in memory of B.J. at Chaboya Middle School in San Jose, CA. Paul Antico: Since B.J.’s passing, you’ve really jumped headfirst into food allergy advocacy, and I’m very thankful for that personally and on behalf of the food allergy community. Could you talk about some of your initiatives and activities? 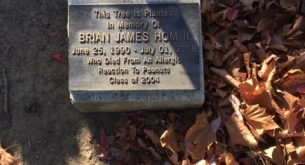 Brian Hom: After he died, we started a walk for him and did it for five years, to help raise awareness, as part of FAAN (Food Allergy & Anaphylaxis Network, now part of Food Allergy Research & Education). We started it in 2011, I think. I think the first walk I participated in was in San Francisco, because there was no walk in San Jose. I asked FAAN if I could bring one to San Jose, and we did. We raised almost $100,000 a year, which was a lot of money for walks, especially new walks. I also joined FAACT (Food Allergy & Anaphylaxis Connection Team), trying to help raise awareness and raise funds to basically find the cure for food allergies because I don’t want to see anybody else suffer a loss like my family has with B.J. I’ve been on TV, I’ve been on Lifetime network, I’ve been in newspapers, and I’ve done school assemblies with Kyle Dine, trying to share B.J.’s story. We helped pass legislation, which President Obama signed nationally, that allows EpiPens in schools. It was a voluntary program, so very few schools were doing it because they didn’t want to take on the liability (even though there was no liability). In California, we passed a law that allowed us to mandate it in all public schools in California, so we had Governor Brown sign that petition into law, and then we also recently passed a law to allow EpiPens in restaurants, which I took the lead in California. I put an EpiPen in my restaurant, hoping that by taking the lead, other stores and other restaurants would follow suit. Paul Antico: That’s fantastic. We’re trying to educate restaurants about their right to carry stock epi [epinephrine autoinjectors] in most states right now, but it’s slow going – this is understandably out of their comfort zone. I didn’t realize you toured with Kyle Dine. I know Kyle and really respect what he does. Tell me about going to schools with him to help educate young children, especially doing so in a way that doesn’t frighten those who may not be emotionally ready to hear your story. Brian Hom: I helped set up some of his assemblies in San Jose. We did maybe six, seven, eight assemblies at middle schools and elementary schools. I would tell my story, being careful not to terrorize the kids, but we tried to tell the story – that it’s serious. It was kind of heartwarming to have a middle school or elementary kid come up and say, “Sorry for your loss,” which is such a compassionate statement from a little kid. Paul Antico: Yes. How were the reactions of the school administrations themselves, given that there are some schools that really get it and some that have been holding out, for lack of a better way of putting it? Paul Antico: Oh, that’s wonderful. Brian Hom: The community around where I live, San Jose, really embraced it. One of the Emmy-winning newscasters for NBC News also has food allergies – a seafood allergy. She was the emcee for my walk. We also had Kyle at my walk, we had some big entertainers, and we had athletes come and support us. Paul Antico: One last thing on advocacy. You’re on the Board of FAACT, and you’ve succeeded in getting the school Epi legislation and the public Epi legislation, not to mention everything else we covered. Is there other advocacy that you’re currently involved with? You’ve done so much! Brian Hom: I opened a restaurant and got involved with Vitality Bowls [restaurant chain] as a franchisee. My involvement now is making a safe place for people with food allergies and also raising awareness. I do that on a daily basis, and that’s what I’m doing now. I’m still on Facebook, involved with a lot of the food allergy community. Paul Antico: Were you interested in the restaurant business before you became a food allergy advocate? Paul Antico: Please tell me more about your leap into the restaurant industry. 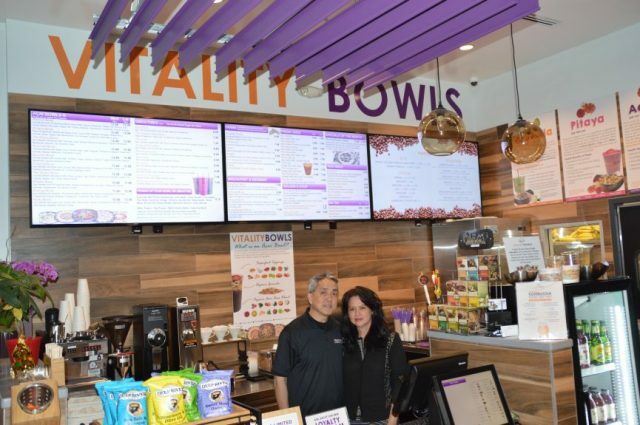 Brian Hom: The founders of Vitality Bowls, Roy and Tara Gilad, husband and wife, had a four-year-old daughter that had food allergies and could never find a safe place for her to eat. They were into healthy lifestyles and healthy food, so they opened their first store in San Ramon in 2011 and it was successful. 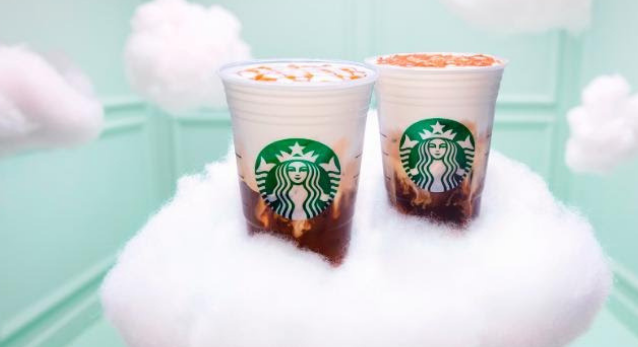 They started franchising in 2014. I get a lot of customers who come in and say, “I know you understand how severe food allergies are and how fatal they can be, and I’ve never brought my kids to any restaurant,” and they bring them into my restaurant, which I think is great. Paul Antico: Wow. Can you tell us a little more about how you keep food-allergic customers safe at your Vitality Bowls restaurant? Brian Hom: The way we protect people with food allergies is, upon entering the store, when somebody says they don’t want certain ingredients, I ask them if it’s a food allergy or a preference, right at the point of sales. We’re asking customers, “Do you have a food allergy,” basically. If they do, we mark the ticket going to the kitchen, that if they have a peanut allergy, a nut allergy, dairy allergy—or you know, a certain fruit allergy, we make sure we move it to a separate station. We have nut-free blenders, so we can prevent that cross-contamination. Second, we do have an EpiPen stocked right at the point of sale, to be used on any customer who we see having a severe food allergy reaction. Third, we have an alarm system in the store that can call the ambulance, can call the fire department across the street, can call the police department, and we can call Kaiser. The Kaiser Emergency Room is within a mile away. I’m willing to drive someone there myself, because I know where it is. Those are some of the things that we do. Paul Antico: You’re the first restaurateur I’ve spoken to who carries an epinephrine autoinjector in his restaurant, even though over half the states have laws that allow it. I think that’s fantastic. What was the process of doing it? Was it challenging or easy? Brian Hom: It was fairly easy. You just need to get a doctor who’s willing to write a prescription for your restaurant. Paul Antico: But how do they write a prescription if it’s for stock epi? Brian Hom: When they passed the law in California, I was trying to figure out, “So how do I get it?” Basically, they said just get a doctor to write a prescription, so they write it to me personally. Paul Antico: Jumping back into your restaurant, what kind of food allergy training does your staff go through? Brian Hom: We have a certification program that teaches them how to – because we serve peanut butter in the store – how to make what we call a Gladiator sandwich, how to use the red cutting board, move it away from other stations and how to clean up afterward, how to use our nut-free blenders… There’s a full allergy certification checklist that each employee has to sign and get certified. Paul Antico: Is that from the Corporate parent company, Vitality Bowls? Brian Hom: Yes, that’s from corporate. Paul Antico: So it’s not an outside program; it’s Vitality Bowls’ own program. Paul Antico: Oh, that’s great. Now, if I had a group of restaurateurs in front of us and asked you, “What’s your best advice for them,” what would you say? Brian Hom: To make sure your staff understands how severe food allergies can be, and that you really need to take food allergies seriously. At the restaurant where Steven had his anaphylactic reaction, where they didn’t label the allergen, the management told me that they were going to label their menus, and it’s now been six years and they’ve [still] done nothing. Don’t wait until you get a lawsuit [or worse! 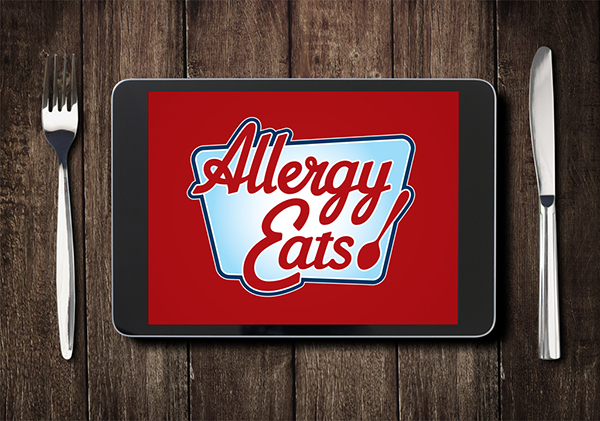 ], to have to change your thoughts on food allergies. Paul Antico: Do you feel like a lot of restaurants by you “get it” with respect to food allergies? Brian Hom: Nope. Only the big chains that actually have programs, have food allergy training, menu guides, and stuff. Paul Antico: You think that there needs to be a lot more education, particularly with the independents, and a lot more training? Paul Antico: I know this is not about the money for you, but do you find there are financial benefits to having a restaurant that’s allergy-friendly versus otherwise? Brian Hom: Yes, because I find that probably 25% of my customers have food allergies. Paul Antico: Wow, and I assume they become your more regular customers? Brian Hom: Yes, we have a lot of them. Gluten intolerances, people with nut allergies, dairy allergies, some fruit allergies. Some people have strawberry allergies or such, but yes. It’s just amazing. Paul Antico: Before my last question, I again want to thank you for all your support of the food allergy community and once more offer my sympathies for how it began. Hopefully your efforts over all these years has helped saved the lives of other children and adults. My guess is that they have. 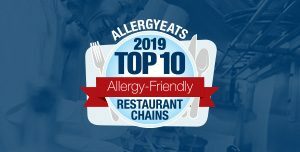 So finally, are there any other key takeaways from this long journey you’ve had that you would share with either the food allergy community, restaurateurs, other advocates or the general public? Anything big that we haven’t talked about? Yes. I would just give this advice. Losing a child is very difficult. Losing them to food allergies is just mindboggling. If you have an opportunity to make it safe as a restaurateur, or make it safe as a parent, or anything, help people understand that food allergies can be fatal. You only get one chance. You don’t get a second chance. The day that B.J. died, I thought it was a bad dream and that I would wake up, and that he would wake up and I would get a second chance. But my takeaway for everybody is to take food allergies seriously. It can become fatal, and you need to do everything you can, and don’t let your guard down. Be vigilant to prevent having a fatal reaction to food allergies. 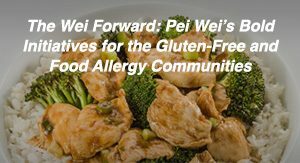 Anything people can do that helps support finding a cure or finding the cause of food allergies so that we can reduce the numbers—and from a restaurateur’s point of view, if we don’t find out why food allergies are on the rise and how to cure it, restaurateurs are going to be impacted. People are going to stop eating out. They’re going to have to start eating at home and really doing things to protect themselves. 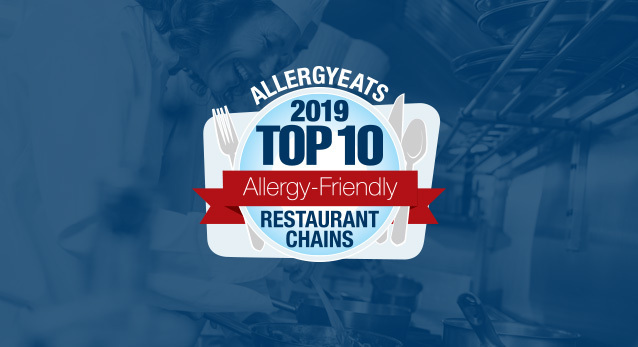 We as restaurateurs—everybody’s going to have food allergies soon and if you don’t start making the changes now – I don’t think the restaurateurs who don’t take food allergies seriously will be around very long. Paul Antico: Yes. Well, thank you, Brian. I’ll tell you, as a parent, and not having gone through what you have, it’s at times really difficult to listen to your story – and I really appreciate you being willing to share it with us. I can only imagine that it’s painful every time you do it, so again thank you so much. 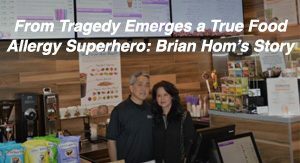 Once again, I can’t express my appreciation enough to Brian for sharing his story and for all he has done, and continues to do, as an allergy superhero in our community. Personally, I’m making sure to have my children read this story. I confess that this was a big wakeup call, even to me, about the risks of what we mischaracterize as “mild” food allergies. Sure, I’ve heard doctors say again and again that the severity of one reaction does not indicate anything about the severity of future reactions, but “our situation was different.” With particular allergens, my kids “only have mild reactions,” easily treated with Benadryl. Certainly, we’ve never let them eat without an AUVI-Q (epinephrine autoinjector), but I guess it’s fair to say that I’ve felt pretty comfortable that nothing truly bad would happen when the inevitable mistake occurs again. No longer. I need to be as serious and vigilant about the real risks from each of their allergens now as I was after the initial diagnoses. More importantly, I need to set that example and teach my kids even more firmly to never take their allergies for granted as they go off into this world on their own, which they’re now doing. I thank Brian for that important reminder. I can only wonder if any lives have already been saved by the sharing of his story and his advocacy efforts over the past 10 years. I also appreciate Brian taking the lead in keeping epinephrine autoinjectors in his restaurant. I doubt even 1% of restaurants in the states that allow “stock epi” know about it. This is another element we need to share. I know many restaurants in my home state of Massachusetts (where stock epi is not yet allowed in restaurants) are ready and willing to take advantage of this opportunity to provide another layer of protection for their guests. I’m sure Brian’s story has touched many of you who have read it in different ways. Please share any thoughts or comments here. We want to hear your voices. Also, if anyone has had a chance to visit Brian’s Vitality Bowls restaurants in San Jose, please review your experience on AllergyEats’ restaurant pages. In fact, we’d love to see more reviews of all Vitality Bowls restaurants, as this is a relatively new, growing chain that seems to have a lot of promise for our community nationwide. (Of course, we still encourage reviews of every dining experience you have every time for the benefit of all of us.) We’re all in this together! Thanks for this important facts and the personal history of Mr. Brian Hom. My family have food allergy and We underestimate the possibility of a severe reaction, but now we will have more care and never go out without Epipen. Thanks a lot. Greetings from Costa Rica. Keep going with your import work, the people need to be aware of consequences of food allergy. Thank you for sharing. This really hit home for me since my 15 yr old has food allergies. He hasn’t had a reaction since he was 5 but we have also been really careful. I need to make sure I always have the epipen with us. So sorry for your loss and thank you for bringing awareness. Much love from Los Angeles. I always suspected that reactions can vary. Thank you for this informative and heartwarming story. My granddaughter has a peanut allergy. I can’t begin to tell you how many times I’ve talked to someone who says they have an allergy but don’t carry the epi-pen because it’s not severe. In the past they had a slight reaction. Thank you for this story and for the Hom Family for sharing their story. It was very difficult to read because I have 3 children who has severe food allergies (Cow’s milk, Eggs, Nuts, Peanuts and tree nuts). I have witness my 2 older children having anaphylaxis at daycare and school. I am thankful that my children survived but we need help in this country to educate all schools and the entire community that food allergy is something that needs to be taken seriously because it kills children and adults. Especial thank you to Mr. Brian Hom and family for your tireless advocacy. We are with you in this journey and we hope and pray that one day we will find the cure so that our children can live a normal life. I have a 13 years old son with life threatening food allergies to peanuts and tree nuts and my heart goes out to you after hearing your study! My son’s food allergies inspired me to open a preschool that specializes in children with the top eight food allergies but with an emphasis on being nut free! I would love for you to email me so that we can connect and share our commitment to be advocates for our children! Thank you for sharing your story. I have a shellfish allergy and my 11 yo daughter has a tree nut allergy. Many restaurants are simply off-limits for us due to cross-contamination and lack of training. Even when we ask to speak with the manager, we are advised to not eat certain items because of the prep cooks who often do not prevent cross-contamination. I have learned to eat from my own table. If and when we are traveling, we carry the Epi-pen and allergy cards in multiple languages. My sincerest condolences. I am in my late 40’s & last year I had a fairly severe reaction to soy & gluten. The reaction was hives all over my upper body that looked like measles and it felt like I was breathing through a thick cloth. Even then, I didn’t take it seriously & waited till mid-day the next day. It took urgent care 2 shots each of benedryl & Zantac & 3 hours to get my breathing under control. To say it has been a challenge to work/deal with these allergies is an understatement. I had to narrow it down to what caused it & I almost had a mental breakdown trying to figure it out because I had to do it on my own with no help from the healthcare community. I always had a suspicion about an intolerance to soy but the symptoms were so minor…usually a sore throat & a rash on my back. Now, even a small amount of either gluten & especially soy, my tounge & throat can swell, my breathing gets laboured & my mouth can break out in hives. The urgent care took it seriously, my dr didn’t. He just shrugged & said food allergies aren’t an exact science. He sent me to an ‘allergist’ who was a total joke. I knew more than he did. Any question I asked he just shrugged & said the same as my dr. His words to me were….If you think you’re frustrated, imagine what parents with small kids are feeling. Yet, he didn’t seem to care. I live in Alberta, Canada btw. It’s been a year now & I am slowly getting the hang of this but I could not imagine having a child with this. It’s hard enough for me to wrap my head & life around this, let alone being a small child too young to communicate or understand. I do not carry an epi-pen but this has opened my eyes. I get delayed reactions. So around an hour to an hour and a half, if I have ingested something containing either soy or gluten, I will start to notice symptoms. So I really have to pay attention to what I eat. I then take benedryl & Zantac together. If I don’t use the Zantac the symptoms continue. The Zantac apparently does something to the digestive system to protect it? Not 100% sure why it’s used but it works. Eating out is a nightmare although I have noticed more allergy free foods in restaurants & on flights. Flying anywhere is also a huge anxiety because a lot of airports don’t have allergy free foods so hunger can get intense. The interview is very informative and its takeaway message is very important. Thank you. This is very disappointing as it means most people with food allergies to these allergens cannot eat safely here. We recently used two epipens after our son with severe nut allergies had an episode. He still could not catch a breath. While waiting for help, we tried Albuterol and thankfully it opened his airway. Just wanted to bring awareness to this if others are carrying epipens but not inhalers. I truly feel the Albuterol cleared his airway and saved his life. Your story breaks my heart and I send you all my love and prayers.